This looks awesome ! I'm digging the cute style. I couldn't see the game test video? it was private on youtube. What platform is it for? and also do you have any release date yet? You had me at cooking. 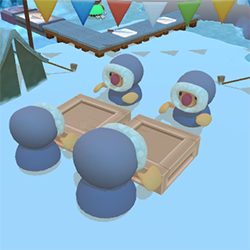 I'd love a local co-op multiplayer (that's not a platformer) to play with my kids! @vividhelix: Glad to meet a fellow co-op and cooking enthusiast We're hoping to cater to younger players in the initial stages and then ramp up the difficulty as the game progress (kind of like Mario i guess ) Teamwork is definitely the key, everyone playing will need to bring their A-game to complete the later levels! Yeah now it works, sounds like people are having fun Cool. This looks so brilliant! Reminds me an awful lot of one of my favourite Pokemon Stadium minigames, Lickitung Sushi Race or something. @DevDennis - They certainly were, despite their whole kitchen being on fire! @JctWood - Thanks buddy. I haven't played that particular minigame but it looks like fun! This week we've been continuing work on the world map. You can now navigate to and select nodes on the map to load new levels (Still working on tying in the unlock system so we can experiment with unlock order/ balancing the difficulty as levels progress. As you can see when pieces move they open up new routes or close previously open ones, as well as moving the object in question to a new part of the kitchen, yet another attempt by us to keep players on their toes as the level progresses! 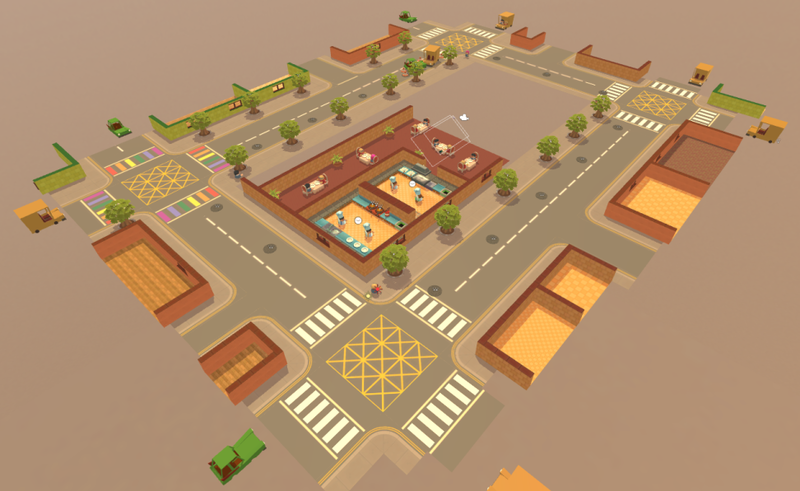 Hopefully going to have a few more play testers in soon to help us find the cracks in our tutorial system and to test out a few of the new level mechanics which have gone in over the last few weeks! This will definitely be a game to enjoy with friends or loved ones. 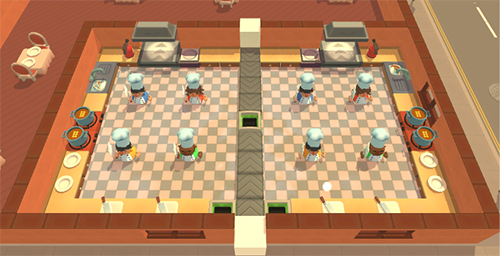 I know that this game is a lot about co-op but have you thought about a game mode where the screen is split into four different kitchens and it's a race to make the dishes. Maybe have powerups to hurt other players? On the split kitchens thing, we kind of have some of that in our 8 player mode, with 4 chefs vs 4 chefs, we're certainly open to the idea of trying to mix around the team sizes and the amount of teams and all that, it's just a matter of how many levels we end up making really. When can we play this! On a side note I really do recommend unprompted play tests as often as possible. It's extremely painful sitting and watching players fail to notice UI or misinterpret instructions but it really is the best way of finding out what aspects of the game need the most attention. We've tweaked the visuals for dirty plates and the pass and other kitchen stations to hopefully communicate their functions a little better. Oli is working on allowing us to animate our GUI so we can draw the players attention to when new orders come in, when orders are running out or when they've lost a life. All designed to try and tighten up our UX. Then we're going back to the world map so we can hopefully have a very basic version of the wider gameloop in place by the end of the month! One mode that would be cool to see for teams or maybe co-op is if one or two people can be designated as the waiter. So now, not only do you have to cook the meal but you have to deliver it to the right table, using memory. It'd be a fun and different experience from just cooking. Possibly have a mode that you play as a waiter only? Also another idea is that you could allow the cooks to eat the ingredients, and based on which one you eat, it affects them. Meat - throw ingredients further? Alcohol - faster cooking but messes with your movement. I really love the art and animations. Everything about this game is looking really fun and polished. This will definitely be a go to game for people during parties. Game looks super great! Love the style and sense of variety. Also, here are some of our experiments for when food catches fire. We're going for something a bit more painterly than photo-realistic. Not sure which one's I'm favouring at the moment... maybe the far left...what do you think? @nt - I know what you mean. I'm always reticent about calling it a cooking game as I think people instantly picture CookingMama or like a physics-based cooking sim, whereas our game is more of a party/...strategy game I guess...! Another week has flown by. Quite a boring but important week really. Oli has been hard at work working on the map/unlock screen which is slowly but surely coming together. We're hoping to have something functional by the end of tomorrow.. fingers crossed! Feeling a lot more comfortable rigging characters now, hopefully I'll find some time to improve on my animation skills so I don't have to settle for whatever I end up with after 15 minutes of fiddling : ) Getting to the stage now where we need to start readdressing our tasks and prioritising them properly! I'm excited to see how each stage offers it's own twist. I'm sure city levels will have no twist. Snowy levels will have slippery floors. Boat levels will have things move back and forth. There's lots of possibilities to not only make each stage look different but play different as well. For that snowy one, it would be fun if you could pick up a snowball and throw it at another chef, which will cause them to be knocked down for a few seconds. Looks great, I really like the overall design and animations, it grasps the kitchen frenzy. It's a neat idea that the levels have unique impacts on gameplay. There's a game I used to play on N64 which had a similar approach, I can't remember its name, but if I do, I'll let you know. The space station reminded me The Restaurant at the End of the Universe by Douglas Adams, which is a read I can only recommend if you hadn't read it. 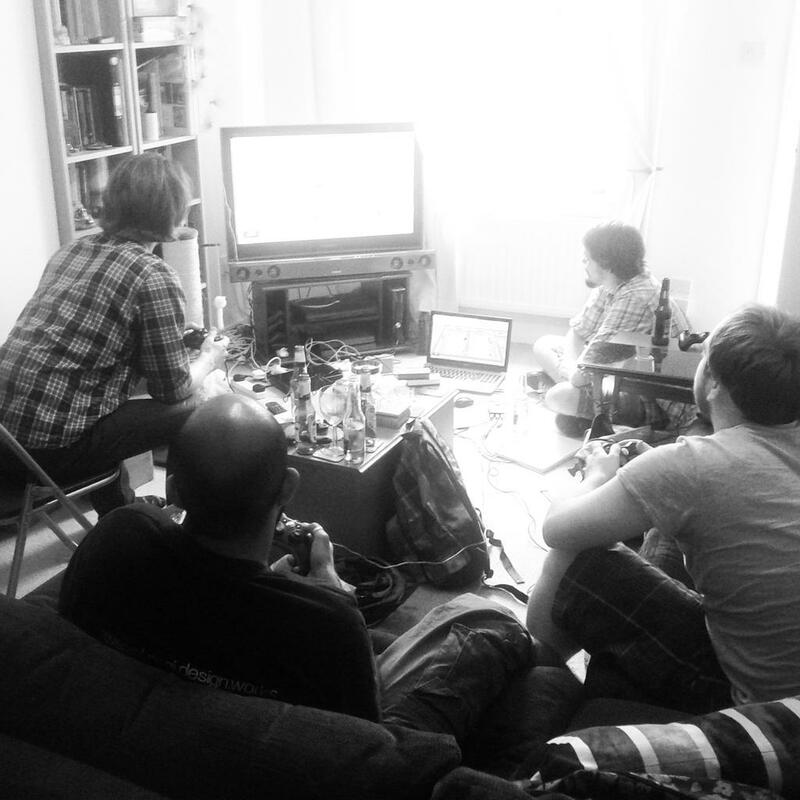 If you ever need feedback, once per month we invite people in our office to play to local multiplayer games. I'm adding Overcooked to the list of titles to try during those nights.